VESTRY MEETINGOn Thursday a vestry held at the Parish Church under the presidency the vicar, the Rev. A. Kinch. Messrs. R. Brown T. Monk, H. Howe, and T. W. Davidson were appointed overseers; and Mr. John Drage was appointed way warden. It was proposed by Mr. W. Drage, seconded by Mr. Revis, and resolved that Mr. T. W. Davidson be appointed as Guardian in the place of Mr. Henry Hutchinson, who has left the village. Mr. Wallis, the rate collector, made an application for an increase of salary from £12 10s. to £15. After some discussion, the matter was adjourned, on the motion of Mr. John Monk, seconded by Mr. T. Corby, till the Easter vestry. The meeting was one of the largest which has been held for several years. 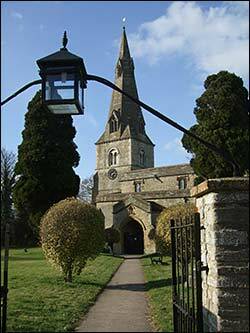 VESTRY MEETINGOn Thursday last a vestry meeting was held at the Parish Church, the Rev. A. Kinch presiding. Mr. Hill, churchwarden, produced the accounts, which were examined and passed. Mr. Howe was re-appointed as vicar's churchwarden, and Mr. Hill was elected for the parish. The application by Mr. Wallis, the rate-collector, for an increase of salary from £10 to £15, was discussed, and it was proposed by Mr. B. Brown, seconded by Mr. T. Drage, that the salary be raised accordingly. Mr. Maxwell proposed an amendment, that the increase should be £3 instead of £5, but this not being seconded, the original proposition was carried. Mr. Maxwell and Mr. Wm. Drage were appointed as assessors of taxes. There was no other business of public interest. There was a good attendance. WOLLASTON - CONFIRMATIONOn Tuesday afternoon a confirmation service was held in the Parish Church by the Bishop of the Diocese. It is the first time in the present generation that a confirmation has been held in this village, and the event caused considerable interest among the people, there being a large congregation present at the ceremony. Seventy candidates were presented by the Vicar, and twenty-eight from Bozeat, and two from Strixton, by the Rev. A. Kinch. The service commenced by singing hymn 157, and the Bishop then delivered a very impressive address, explanatory of the service that was about to be performed. He hoped that all who were about to be confirmed would not consider it an idle form and a mockery, but that all of them would be the true servants of Christ. The candidates were then confirmed. Hymn 379 was next sung, and the candidates proceeded to the Church. Sunday School where an excellent tea was provided for them by the ladies and gentlemen of the parishes. At intervals during the day peals were rung on the church bells. VESTRY MEETINGA special vestry meeting was held in the Church on Thursday morning, April 12, to consider the plans for the restoration of the church, present: Rev. A. W. Secker, vicar; Messrs. Hill and Howe, churchwardens; and Messrs. W. Maxwell, J. Drage, J. Monk, H. Drage, W. Drage, T. Belcher, R. Brown, J. Dalley, T. Wallis, T. Dobbs, H. Partridge, W. Cook, J. W. Davison and J. Kirby. It was poposed by the vicar and seconded by Mr. Hill that the chancellor be petitioned to grant a faculty for the restoration of the church. This was carried unanimously. The plans of the proposed alterations were then examined. First it is proposed to restore the tower and spire just as it before. The estimate for this is £748. It is divided into three parts(a) estimate for tower, £506; (b), half way up spire, £102; (c), remaining part of spire £140. The work may be stopped at any stage according to the direction of the Committee. Secondly the plans provide for restoring the fabric of the church. The estimate for this is £1625. This includes new roof, new floor, new seats in church, and clock, new organ chamber, &c. The present accommodation in the church is for 145. The proposed new seats will amount to 124, total 269. The estimate for rehanging the bells is £140. This includes re-casting the second bell, which at present is at Mr. Taylor's bell foundry, Loughborough. In addition to this there is the clock; the estimate for taking down, repairing, and refixing the clock with two dials, is £12 10s. At present it is proposed to restore only the tower and spire, and to re-hang the bells. The contract for tower and spire is £748. The amount of subscriptions paid and promised is £750. A committee has been formed to carry out the work, and it was resolved to begin the work at once. The contract was read and approved of, the only clause on which all were not agreed being the advisability of appointing a clerk of the works. The contractors are Messrs. Neal and Margetts, of Kettering, the architects Messrs. Carpenter and Engelow, of London. At the end of the meeting the contract was signed by the following members of the CommitteeRev. A. W. Secker, Messrs. W. F. Hill, H. Howe, J. Kirby, Richard Brown, W. H. Drage, J. Mock, and J. W. Davison. The work is to be completed by November 3rd, 1883. THE OLD CHURCH TOWERWe shall soon see the last of our old tower, which has been standing roofless and in ruins (the stones of the spire lying about the churchyard), for the last six years. The work began on Monday last, and all the stones that are fit to be used again will be marked and laid by. The clock has been carefully taken down and is placed in the care of Mr. R. Brown, till wanted again. Perhaps a short history of the spire will be interesting. The tower was built in the 12th century, towards the end of the Norman period. The Norman towers, as a rule, were not famous for durability, and Bozeat tower is no exception. The mortar was nothing but soft dirt, and the stones of its walls simply rough rubble work thrown in anyhow, sometimes with mortar sometimes without, and with no bond stones of any kind. Originally there was no spire. In the 14th century the church was pulled down and enlarged, and the spire built; most likely the tower had even then shown signs of weakness for the upper part from the belfry windows seems to have been rebuilt. In the 15th century there were inserted in the west wall of the tower the present doorway and two large light windows, and buttresses were added at the N. W. and S. W. corners, thus showing that the walls were continuing to give way. In 1729 the church and tower narrowly escaped being burnt down. [for more see Bozeat village] On the 9th of September a fire broke out in the old workhouse which adjoins the churchyard, and in four hours 41 houses, four farms with their total crops, and the vicarage were totally destroyed. The bell frames were twice on fire, but were fortunately put out, both times before any serious damage was done. In 1753 two buttresses were found insufficient, for the north wall split up the centre, and the west wall leaned forward, and it was found necessary to carry up a great buttress (half the width of the tower itself), against the west wall partially blocking the door and windows. The vicar at that time was the Rev. John Lettice, and the churchwardens Thomas Dexter and Robert Addis. That bill was as follows:Going to Buxton for scaffolding, 8s. ; three loads of stone, 10s. ; two men day each loading stone, 1s. 4d. ; 16 loads of sand 16s. ; 25 loads of stone, 8s. 4d. ; two men filling, 1s. 4d. ; taking scaffolding home, 8s. ; four men, day each, 2s. 8d,; Richard Parson's bill, £11 2s. ; 15 quarters of lime, £2 12s. 6d. ; carriage of 10 quarters of lime, 10s. However, the mischief still went on, the tower was crushed between its heavy spire and rocky foundation, and 70 years ago the top part bulged out so much on all sides that iron bands were rivetted all round. This was most probably done in 1812 by John Monk, the village blacksmith at a cost of £2 12s. These iron bands broke on Wednesday, January 4, 1877, and about 300 cubic feet of the tower and spire fell out on the roof of the church, leaving the spire in a very dangerous state. The vicar at the time (the Rev. F. J. Pizey), immediately sent for the architect (Mr. Carpenter, of London): the spire was carefully taken down by Mr. Foster, of Kempston, the stones being marked and laid in the churchyard, to be used again when the spire was re-built. It is now proposed to restore the tower and the spire, showing the three periods which it was built, viz. : (a) Norman tower; (b) spire (14th century); (c) window and door on west side, and buttresses on N.W. and S.W. corners (15th century). Of course the huge unsightly buttresses erected in 1753 will not be re-built. The total cost of re-building the tower and spire and re-hanging the bells will be over £1,000, and of this £750 has been raised. £40 was raised before the Rev. F. J. Pizey resigned. This was increased to £630 during the two years the Rev. A. E. Kinch was vicar, and over £100 has been raised during the three months the Rev. A. E. Becker has been vicar. THE CHURCH TOWERThe church tower is now all down, the foundations are dug out, and all is in readiness for the foundations, which are to be of brick and concrete. The old foundations were remarkably curious. Their depth and thickness were about 5 ft. On the rock was a thick layer of clay; on this a row of ordinary stones was placed end ways, the sharp points bedded in the clay, and the whole closely packed together without mortar or cement of any kind. This bottom row leaned at an angle of 45 degrees from south to north. Then came a layer of road dirt about 4 in. thick; on this was placed another row of stones, the sharp points again bedded in the dirt, but leaning in the opposite direction to the bottom row. On this was placed another layer of road dirt, and another row of stones was set on this, leaning in the same direction as the bottom row. At the corners on the north-west and, south-west, the middle row of stones, instead of being inclined from north to south, was inclined from east to west. No mortar or cement of any kind was used between any of the stones in the three rows, but not a stone had given way, and all stood as they did when put in seven hundred years ago, thus showing that the architect was right when he said that the tower had been crushed between its heavy spire and rocky foundation. It is very probable that the first church and this tower was built by the villagers, under the direction of the priest, for there was no skilled work of any kind, the tower simply being four walls, each four feet thick, with a door leading into the church. The window and door, which were inserted in the fifteenth century, and half of which were covered up by the huge buttress erected in 1753, were found to be perfect; and will be put in again, and a beautiful little Norman window was found in the south side of the tower, under the many coats of plaster which have been used at various times to hide the cracks in the walls. 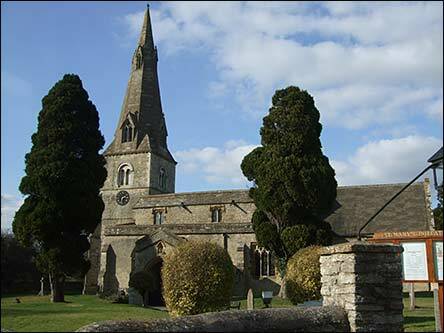 BOZEAT - ACCIDENT AT THE CHURCH TOWEROn Saturday, July 21st., a serious accident happened at the rebuilding of the Church Tower, at which two workmen James Ball and Thomas Ball, (brothers of the foreman), were seriously injured. The scaffolding inside the tower (which is now about twenty feet high), was during the absence of the foreman overloaded with stones three times the weight it could bear being put upon it, and about eleven o'clock in the morning it broke, men, stones and planks all falling together. Help was at once given by all present and every attention was given to the men. Dr. Orr, of Wollaston, was sent for and was in Bozeat in less than half-an-hour after the accident happened. James Ball was found to be suffering from a broken ankle, and is now progressing favourably. Thomas Ball is seriously injured about the head and is bruised all over, great stones falling on him. He is we are sorry to say still in a critical condition. A correspondent writes us:The Vicar of Bozeat has just shown to the dissenters what he would do if it was not for the law, and in this case I have no doubt he has broken the law to show his animus. Mr Thomas Surridge lost his baby by death, and just when they were starting with the corpse a message was sent to say that it would not receive a Christian burial, because he (the Vicar) could not find its name on his church register. He was informed the child was baptised at the Independent Wesleyan Chapel, but it seems that was not good enough for him, so the poor child was not allowed to be taken into the church. I may here mention that the dissenters of Bozeat feeling anxious that no unpleasant feeling should exist between them and their church neighbours, had until now abstained from taking any action under the Burial Act, and have allowed the Vicar to perform the ceremony, and this is how he treats them. I should have thought under the circumstances, and as the time is near when we celebrate the coming of our Lord, of whose advent the angels sang ‘Peace on earth good-will to men’, that he would have shown a more Christian spirit towards the parents whose trouble is very great, losing their only daughter, without being treated in this manner by one who affects the Apostolic succession.